The most professional of all HAPPY CATs, is now even more powerful! This version with a high-tech mast made of 100% carbon, weighs 6 kg less and offers attractive advantages: Sensationally light, only 21 kg per bag. Even more stable sailing on one hull through later tipping point. Very easy lifting after capsizing. Even better mainsail profile due to lower bending curve. 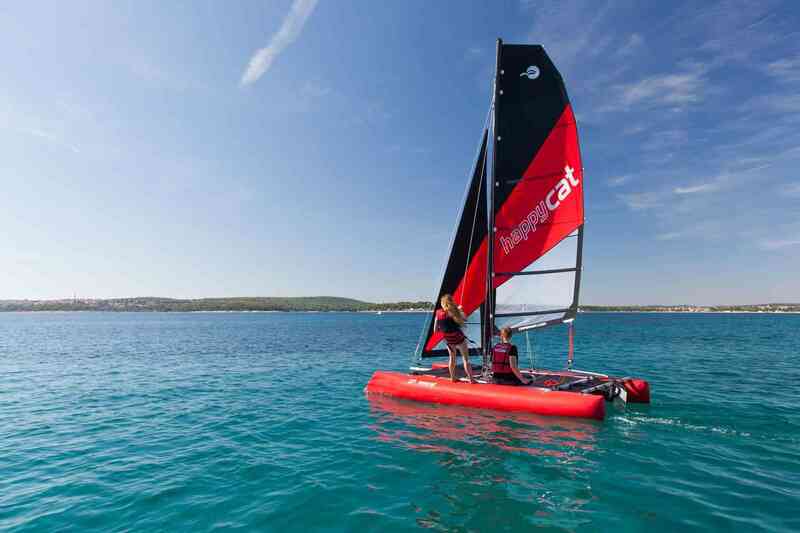 WARNING: This catamaran makes sails addictive! Sail with over 16 knots! 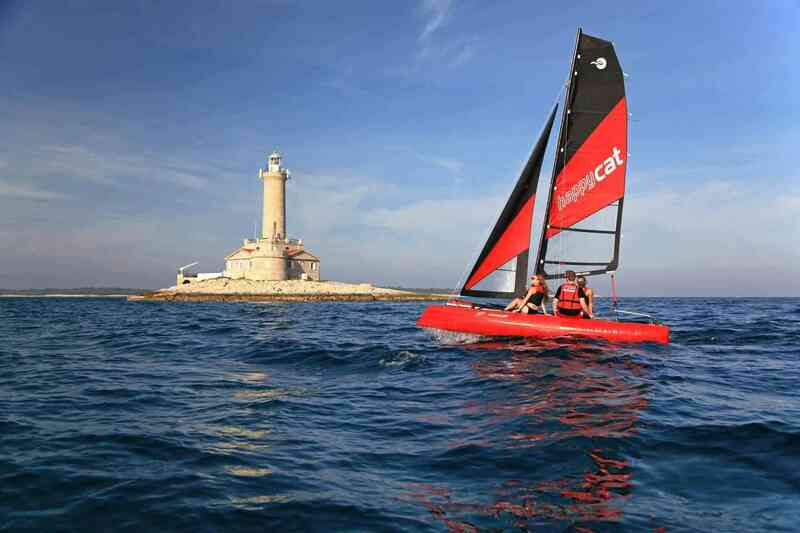 Carbon mast: Light as a feather! The HURRICANE is now available with a professional carbon mast. 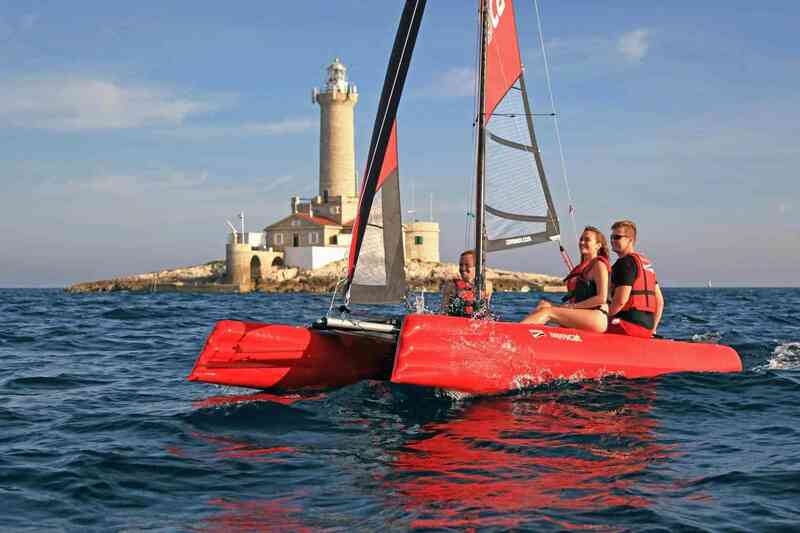 A absolute recommendation for sailors who set high priority to best sailing performance as well as sailors who often sail on big inland waters and at sea. The mast section is drop shaped and equipped with a track for the main sail bolt rope. Made of 100% carbon fiber for highest stability at lowest weight. A tailor made cushioned carrying bag is included in the carbon mast version. 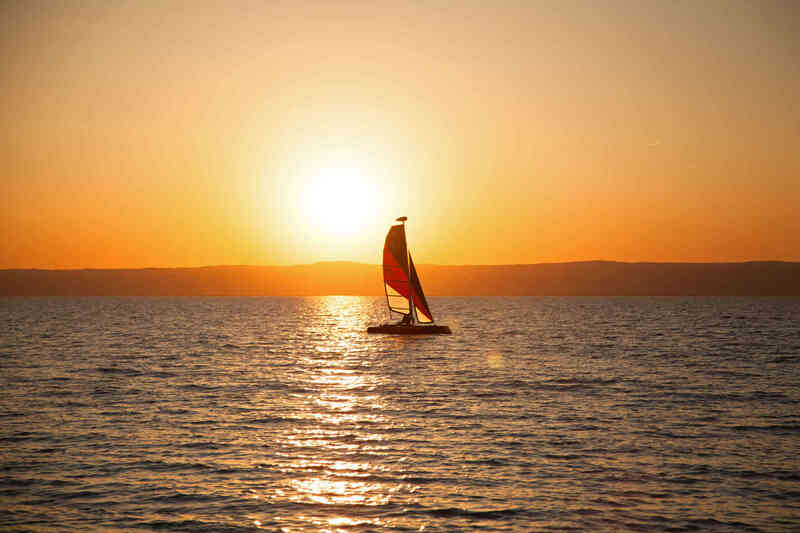 “Smoother sailing behavior”: Sailing on one hull is more stable, the tipping point occurs later. 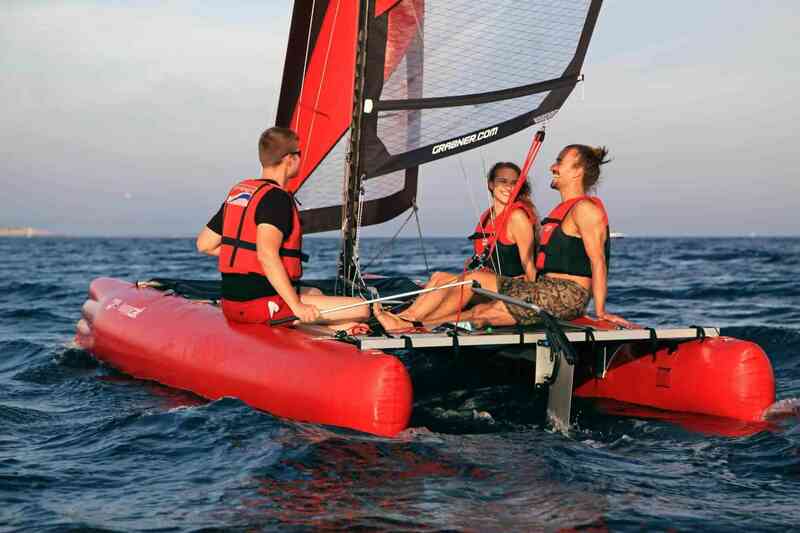 It is more easy to right catamaran after capsize because of lower mast weight and certain mast buoyancy. 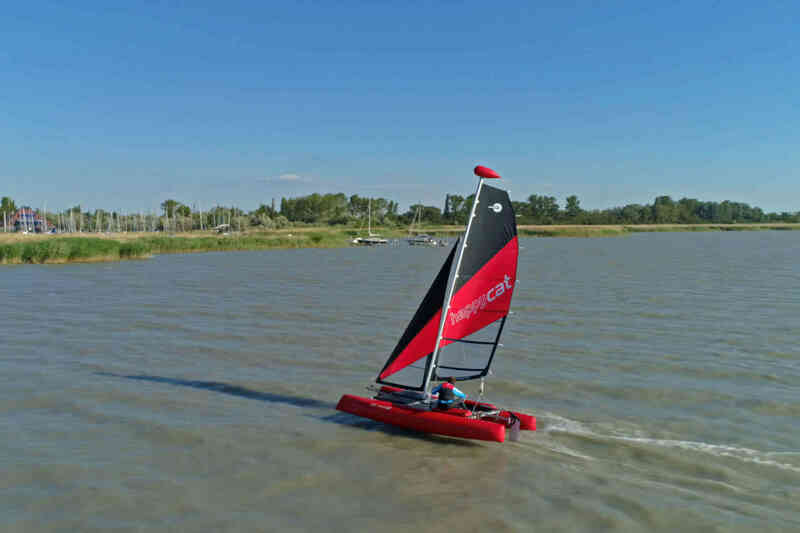 Cut through the waves at maximum speed or experience more buoyancy: This is ensured by the convex hull bottom, the hulls with a diameter of 54 cm in combination with the Wavepiercer bow and the long waterline of 499 cm! 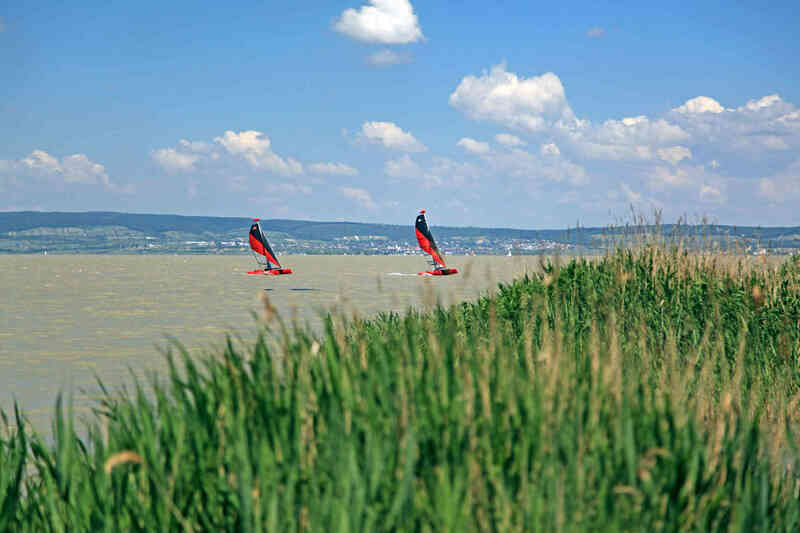 This is the ideal hull shape as it not only allows you to be extremely fast but also protects you from water splashes so that you can enjoy a stable ride with low water resistance. 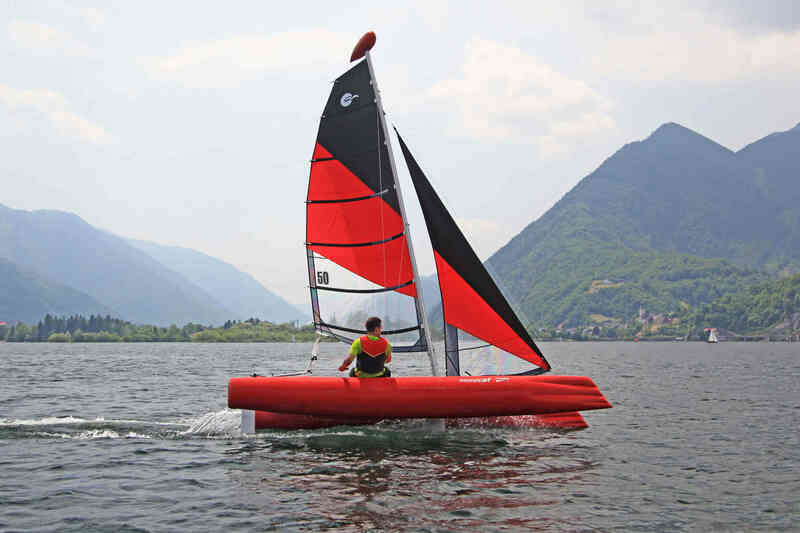 It is stable and has improved bow and stern buoyancy for extra loads and even more safety. And yet it is fierce like a hurricane! 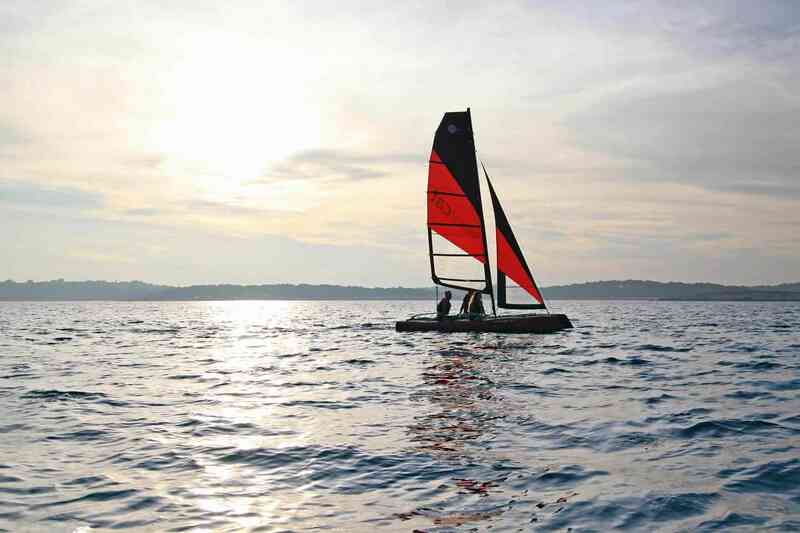 This inflatable Grabner travel catamaran has been developed and optimised through tank testing and the boat-skin is hand made from strong Grabner car tyre rubber. Two strong braces reinforce the hulls in the bow area. This gives constant rigidity just like a hard shell hull and creates even more speed and less spray. The hull and frame are firmly and stably connected by sleeve inserts, while the special square profile frame with angular connectors provides high torsional stability and doesn’t twist. The trampoline mesh is integratedseamlessly and directly into the profile frame and offers plenty of space for comfortable sitting. 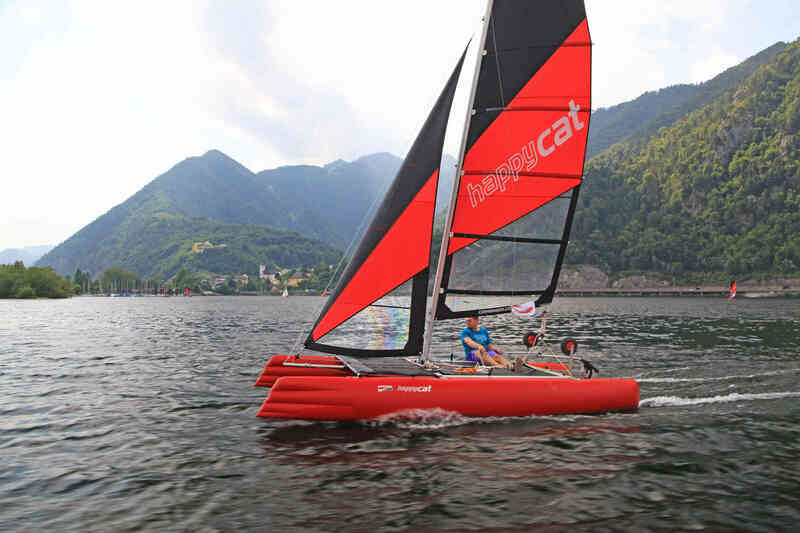 A powerful 6 hp-engine can be mounted to the saltwater-resistant anodised aluminium frame to accelerate the inflatable catamaran to a breath taking speed of 25 km/h. The crossbar, which is included as standard, stabilises the hulls in the bow area. The optional foredeck increases the usable area, protects from spray when sailing at a high speed and can also be used to fasten luggage – or to lie and sunbathe on it in relaxing holiday moments or when you feel like lazing in the sun! Thanks to the fixed crossbar, you can comfortably get into the boat via the foredeck. No wind? With the optional motor-bracket, you can mount a small auxiliary electric motor onto the rear bar to keep you going when there is no wind, which will not get in the way when sailing. 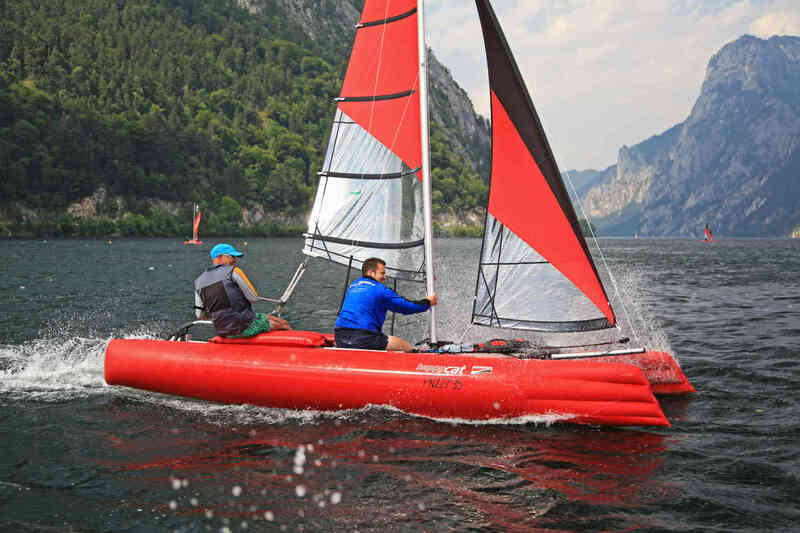 The hydrodynamically optimised centreboard extends deep into the water to counteract the lateral drift in the best possible way. The inclination is infinitely adjustable so that the centre of pressure by can be optimally trimmed for speed on any course. The robust aluminium centreboard releases automatically when it touches the ground and it can be pulled in completely during landing. The “kick-up” rudder is extremely robust thanks to the cast metal rudder head (black). The sleek, hydrodynamically optimised blade extends deep into the water to improve steering control. Instead of using cable pulls, you can comfortably and directly haul the blade up or down from the tiller, which has two lock-in positions: folded up or lowered down into the water completely. It releases automatically when it touches the ground. 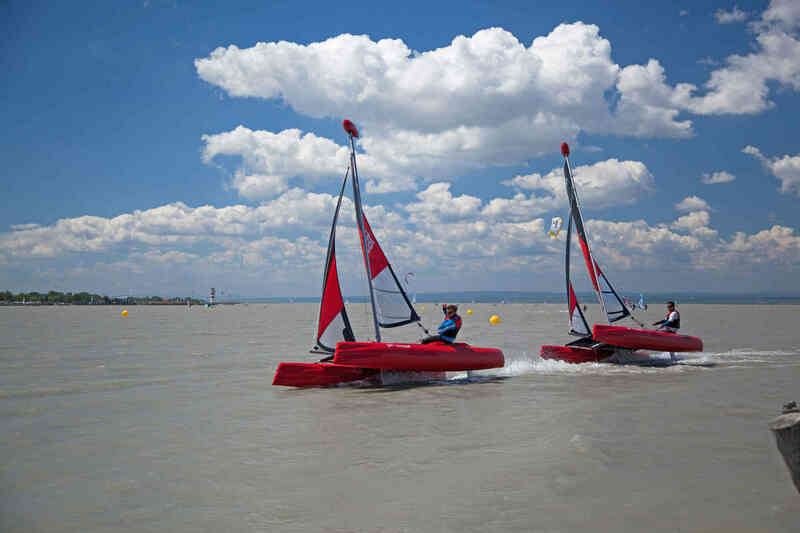 The high-speed rudder, which is shifted to the rear due to the outrigger, provides the best steering control and makes it easy to steer smoothly and steadily. The mast foot ball joint is new and innovative. 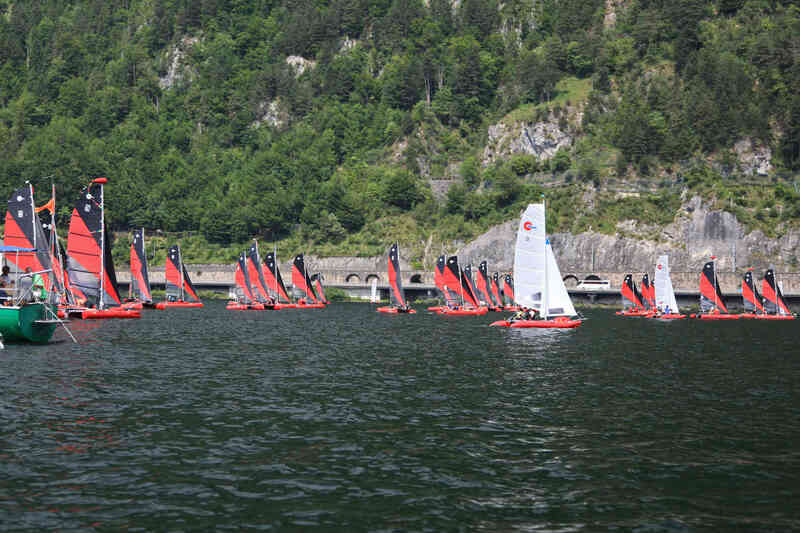 Even when there is only little wind, the mast rotates easily with the sail and thus improves the overall profile. With the rotational limiter, the mast rotation can be restricted for light to strong wind conditions and the mainsail can be sailed flat or more bulging. For the best trim in any wind condition. The practical mast foot joint also makes it easy to right the mast, which can be righted and lowered by just one person. An additional forestay with which the mast can be adjusted independently from the sails and for extra safety. Always the ideal profile:The fully battened mainsail with a surface area of 8 m² provides the ideal profile – the batten tension can be adapted to a wide range of wind conditions. 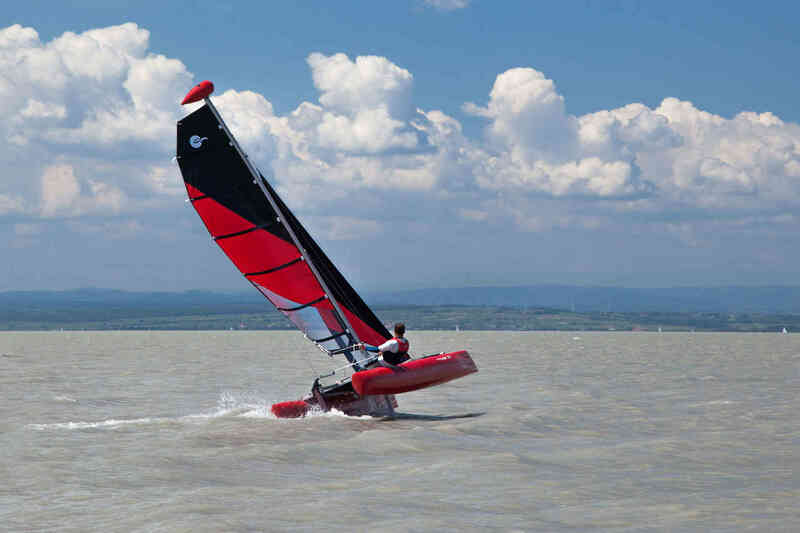 In light wind, the wide upper ‘Square Head’ sail section provides extra performance. 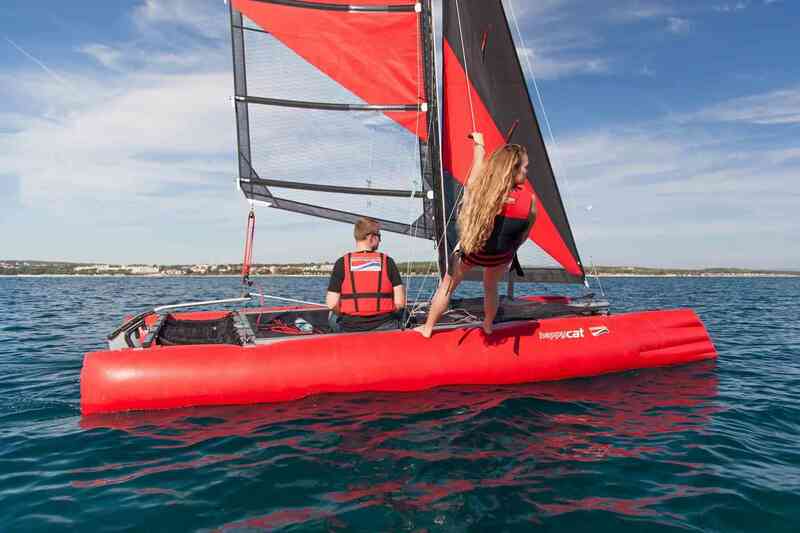 Never hit your head again: The modern cut of the catamaran mainsail provides a larger sail surface and creates less turbulence – and since it has no boom, you will never hit your head again. Thick Dacron canvas and large reinforced windows give rigidity and good all-round visibility. Tow points for height: The tow points of the 3.50 m² jib are fixed at an ideal position close to the mast in order to be able to sail with more height and to ensure a good foresail profile, even when sailing wind abeam. The comfortable continuous jib furler makes it easy to furl the foresail. With the jib halyard pulley, you can easily adjust the tension of the rig manually. Per Traveller: Depending on the course, the tow points of the mainsheet are shifted towards luff or lee using the traveller. No matter if you sail wind abeam, before the wind or close to the wind: The mainsail “twist” is reduced and the performance is increased.  Per clew plate: Adaptable to the wind conditions, the mainsheet is hooked either further to the front or to the rear so that the mainsail has a bulging or flat profile. With ease: Thanks to the 4:1 mainsheet transmission, it is easy to manoeuvre the mainsail by hand – even in stronger wind conditions. The best trim for the speediest sailing. 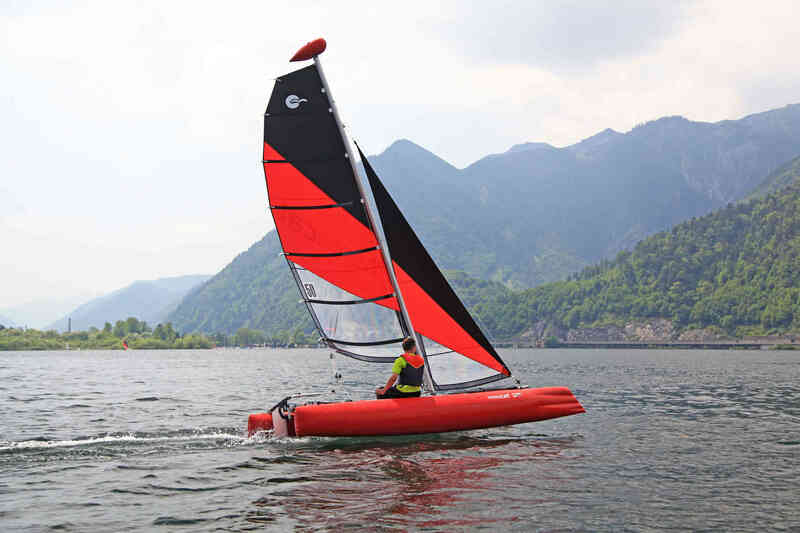 An optional 11 m²gennaker can increase the travel speed by up to 30 % when sailing with sideshore wind or wind abeam. The trumpet ring of the snuffer allows you to quickly right and recover the gennaker. Sailing action with the HAPPY CAT HURRICANE. 16' 2" x 1' 9"